So sweet, it's basically dessert! In the south we love our tea sweet - and our potatoes the exact same way. The North Carolina sweet potato is the envy of all other potatoes worldwide. North Carolina is one of the top producers of sweet potatoes. The climate is perfect for producing the highest quality sweet potatoes available. Sweet potatoes have fewer calories, carbs, starch and more than 1,000x the amount of Vitamin A than any brand of white potatoes. A new study suggests that consuming waste water from sweet potatoes cooking may offer up a trimmer waistline. JFC sweet potatoes have a distinct orange color, sweet flavor, large size and unrivaled health benefits that make it the perfect side or feature of any meal. Since we have our hands in the entire process, we can make sure that we are delivering the best products from our family farm to your family’s table. A southern-cooking staple, white sweet potatoes are very similar to that of an orange sweet potato. However, this sweet potato variety has a golden skin color, creamy white flesh and crumbly texture. If you enjoy sweet potatoes but prefer a milder flavor, white sweet potatoes will do the trick! They can be prepared for either sweet or savory dishes. 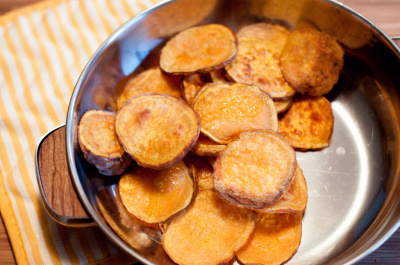 Did you know:​​​ Roast sweet potato slices in the oven and honey drizzled over them. Then sprinkle with cinnamon to make them extra tasty and a very nuttitious snack.